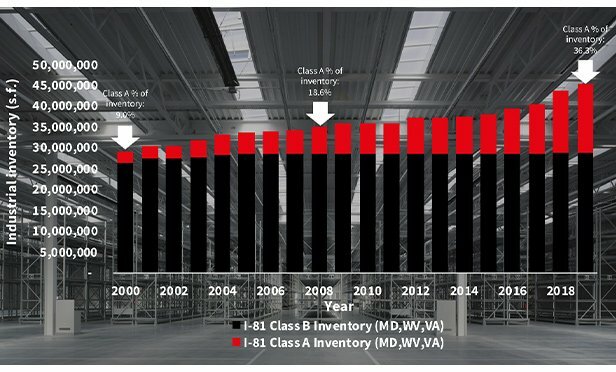 Interstate-81 runs just 75 miles west of I-95 and gives distributors a less congested and toll-free route to move goods up and down the East Coast, JLL says. HARRISBURG, PA—A tight labor pool in central Pennsylvania is challenging developers of logistics space to think about pushing the corridor further south into Maryland and even Virgina, according to new research by Jones Lang LaSalle. “Investors from New York and Philadelphia are starting to look toward the Lehigh Valley as a means to obtain higher yields where demographics continue to improve, and development is picking up,” says Marcus & Millichap's Daniel Bernard.